1. Avon True Color Eye Shadow Quad in Berry Love (c/o) - I have said before that little surprises me with makeup, but I had truly not expected this palette to knock my socks off the way it did. The pigmentation is unreal, the colors wear all day and blend effortlessly. And 3 out of the 4 shades are matte. Basically it's perfect. 2. Stila In the Garden Palette - There are a few Stila palettes that people talk about (this and this being two of the most buzzed about), but I fell in love with these colors after I brought this with me on vacation one time. Though there are 2 or 3 less neutral shades in the mix, I was shocked to see how easy they were to wear when blended with other basic colors. 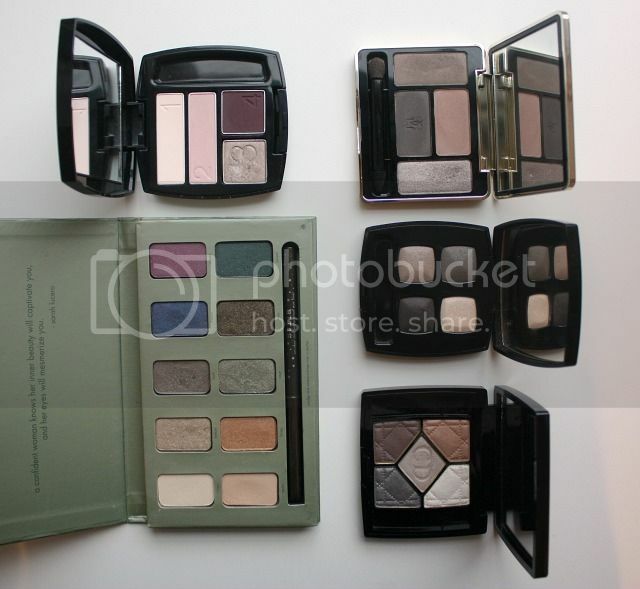 The pigmentation is rich but not enough that any of these are overpowering. Most give a nice wash of color and that is what appeals to me the most. Plus the packaging is just so darn cute. 3. Guerlain Ecrin 4 Couleurs in Les Fumes - When am I not loving something by Guerlain? I rave about their products over and over again, but it's worth every accolade. To describe these shadows as buttery smooth is an understatement, it's almost velvety to the touch. And this color combination gives the most stunning daytime smoky eye, subtle enough for the workplace but a great segue into an evening look if needed. 4. Chanel Les 4 Ombres in Prelude - This was my first Chanel eye quad and it certainly won't be my last. Nothing gives me a more perfect crease-style eye look than this quad. And naturally Chanel strikes the perfect balance between shimmer and matte - which so many companies try to achieve but fail miserably. The colors have good pigmentation but I find do require an eye primer so make sure you apply one first. 5. Dior 5 Couleurs in Greige - Ugh, the color greige is such an awful word to say but truly is my favorite color family. Nail polishes, clothing, makeup, shoes - give me all the greige. This palette definitely has a strong shimmer but the colors blend so smoothly that it works well for day or evening. I often grab this palette to pair with many of my favorite single shadows, because the colors are great accent colors to add into the crease and outer corner of the eye to add dimension.